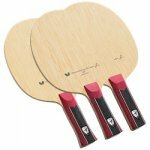 This is a specially designed combo, including one BRAND NEW blade, the professional Galaxy T-2s carbon blade with a Flared handle, one sheet of 729 Higher Tension Rubber and one sheet of 729 Geospin Tacky. These three items make a particularly good combination, for a high speed and high spin game, still with excellent control and the combo will be quite light. Style: This combination is suitable for a style based on high speed and high spin attack on the forehand, set up and complemented by a high spin and controlled backhand. Forehand: The 729 Higher Tension rubber is a high spin looping rubber. The thin and highly elastic topsheet of the Higher loads up like a spring when you brush loop it, and produces very high spin and good speed. The 729 Higher is a reasonably a fast rubber, and carbon fiber layers in the T-2s giving it that extra speed, making it also a very fast combination when you hit it harder..
Backhand: The naturally weaker backhand requires springy sponge so that blocking and looping/drive can be done with less effort, and a tacky topsheet for heavy chop or topspin. 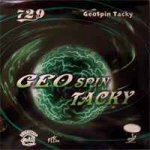 The Geospin Tacky has the fairly soft and springy 'Power Sponge', and a very spinny, super elastic topsheet, which fits this combination perfectly. Although the Geospin Tacky rubber is a little slow, the Carbon Fiber T-2s easily makes up for this. The bat will be put together for you free of charge.